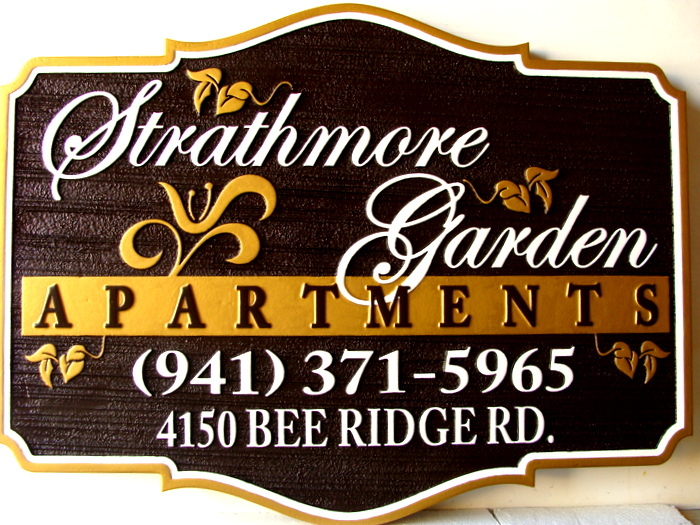 Shown above is a metallic-gold painted carved 2.5D High-Density-Urethane (HDU) apartment entrance sign. Gold, black and white gives this sign an elegant appearance. This sign is 96 inches wide and is located outside the entrance to the apartment complex. Prices for these gold, silver painted wall plaques vary widely with size and complexity of design. These custom metallic painted plaques cost the same as our other color painted HDU wood plaques, and are about half the cost of our metal-coated and gold- and silver-leaf gilded plaques & signs. To see prices or get Estimate and Order forms , click on gray boxes in upper left margin. Click on dark gray tabs on the header to see Home and other informational pages. Click on one of the light gray numbered boxes to see other photo Galleries, including other apartment signs in Galleries 19 and 19A.